Tetsusaiga is Stolen! Final Battle at Naraku’s Castle! Episode Capsule last revised on 09 Feb 2008. Is it that simple? He looks exactly the same. Can one hate and forget so easily? Don’t underestimate me! I am a Demon Slayer! I don’t fall for dirty tricks! If I were in your position, I probably couldn’t do it. First appearance of Kagome's Sacred Arrow. Flashback of previous episode, at Naraku’s castle. Back view of NAR. He is facing a silhouette outside the room. The screens turn a blood red. Black frame with a small fire. Black frame fades to reveal INU-gang sleeping in a hut around a fire. SAN gets up and looks at INU. SAN reaches out her hand towards INU. She is taken aback by her own actions and holds back. SAN: (thinking) What? What am I doing? The fire cackles and SAN is surprised. She looks in INU’s direction to check if he was woken up by the noise. INU: (waking) Sango, what’s the matter? SAN: Nothing…Couldn’t sleep. That’s all. INU: I’m gonna kill him, although I feel badly for you. KAG wakes, but INU and SAN do not notice. INU: Is it that simple? He looks exactly the same. Can one hate and forget so easily? SAN: Don’t underestimate me! I am a Demon Slayer! I don’t fall for dirty tricks! INU: If I were in your position, I probably couldn’t do it. SAN looks away in silence. Flashback of INU sitting next to KIK on a knoll. KAG: (voice-over) Looks exactly the same. (KIK smiling at INU) So he can’t hate or forget. Cut to present, SHI sleeping next to KAG. KAG: (thinking) Inuyasha is speaking of Kikyo. MIR: (awake) Inuyasha…Be on your guard. We are surrounded. Cut to outside. KOH approaches the hut with white demon orbs behind him. Hordes of demons surround the hut. INU-gang rushes out. MIR taking off the beads round his wrist. SAN: Hey Miroku! What’re you doing?! Your Wind Tunnel isn’t completely healed! INU: (raising his hand) Stop it, Miroku! Don’t hurry to death for these small fish. I just have to go and get rid of their boss! Cut to demons raring to attack INU-gang. KOH looks expressionless. He raises his right hand and the demons sprang forth to attack. INU: (leaping towards the demon horde) Go away, vermin! INU slashes away several groups of demons with TET. KOH sends a pallet in INU’s direction, which engulfs TET. KOH leaps and attacks INU with his sickle. INU dodges every move. INU: You plan to fight me with that level of skill?! INU retaliates, swinging TET at KOH, who leaps away. INU pulls his sword and drags KOH to the ground with the pallet chain which was engulfing TET. INU: (leaping into the air, TET pointing at KOH) Finishing blow! KAG: No! Don’t kill him! INU, hearing, stops his attacks and TET stabs into the ground instead. KOH gets up and INU slugs him. INU: Damn! (KOH was sent flying back onto the ground) I’m easy! Way too easy! (vexed) It’s okay to kill ‘im! This is Naraku’s trap! I’ve got to kill him! KOH: (getting up) You’re right. I deserve to die. KAG, SAN and SHI equally shocked at what KOH said. KOH: I…I killed them all. Father…our friends…the villagers…I killed everyone. (looks up) That’s why…I deserve to die. KOH raises his sickle and points the sharp end in his direction. He stabs his own back where the Sacred Jewel fragment is embedded. He falls to the ground. INU: (shocked) Hey! What’re you doing?! What’re you up to?! KOH reaches for the Sacred Jewel fragment, which begins to glow. SAN: (thinking) Kohaku’s life is sustained by the fragment of the Sacred Jewel imbedded in his back. If the fragment is removed, Kohaku will die immediately! KOH continues to reach for the fragment. SAN takes her HIR and spins it. HIR hits TET which sends it flying into the air. SAN catches her HIR as it spins back towards her. TET lands in front of her, transformed back into its rusty state. INU: (looks at TET, then at SAN) Sango! SHI: What’re you doing?! Sango! KOH runs off and takes off from one of the demons. SAN picks up TET, KIR sprints while transforming into her flying form. INU: (agitated) Wait, Sango! What’re you doing?! The demon horde transform into white light orbs and surrounds SAN. The white orbs combine into a huge orb, engulfing SAN. Cut to KAG running out of the hut with her bow and arrows. KAG: Let’s go, Inuyasha! (seeing MIR, SHI and INU frozen) What’s the matter, Inuyasha? Miroku, too? MIR: How about it, Inuyasha? INU: I still smell it. That boy…Kohaku’s blood is still here. It still reeks out it. SHI: Naraku is luring us to him. Cut to INU sprinting across the woods with KAG on his back. MIR is behind, sprinting with SHI on his back. MIR: My Wind Tunnel is sealed and the Tetsusaiga was stolen. INU: Who cares! I still have my fists! Cut to SAN flying on KIR’s back. They land on a roof top in Naraku’s castle. SAN: This castle… (KIR surveys the area) Kohaku. Kohaku! NAR: (voice heard from one of the buildings) First, put down the Hiraikotsu. Pans downwards to reveal NAR in his baboon suit sitting calmly on a stair. SAN jumps from the roof top and lands in front of him. NAR: Good work, Sango. You brought me the Tetsusaiga, Inuyasha’s sword, as promised. SAN: Let me see Kohaku. Only then will I hand over this sword. A red light emits behind the screens where NAR is sitting. KOH’s silhouette is seen. SAN: Naraku! Turn Kohaku back to his former self! Right now! NAR: Killing me won’t help. You know that already. It’s all the fault of the Sacred Jewel. Cut-scene of the village of the demon slayers devastated. NAR: (voice-over) Demons desiring the Sacred Jewel attacked your village. Cut-scene of SAN’s father faling unto the ground. 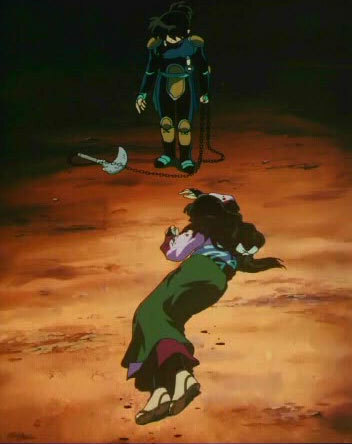 Cut-scene of KOH falling with arrows in him. NAR: (voice-over) that your brother’s soul now wanders…(SAN crawling towards the fallen KOH) are all because of the curse of the Sacred Jewel. SAN: Stop this nonsense! You killed my father and comrades! Just because you covet the stupid Jewel… you did it all! NAR: People die because of the power of the Sacred Jewel and people live because of its power. Do not despise the Sacred Jewel so much. Kohaku was revived because of the Jewel’s power. The promise was to exchange Kohaku with the sword. What will you do? SAN: (pointing TET in NAR’s direction)You despicable…! What promise?! (leaps towards NAR) This is my answer! SAN throws TET at NAR in mid-flight. She clenches her right fist, tearing the cloth wrapped around her arm, revealing a blade. NAR grabs TET and blocks SAN’s impending attack. SAN attacks again, NAR blocks and leaps backwards. SAN slashes at NAR’s baboon suit. It tears away to reveal black locks of hair. NAR lands a distance away. His suit falls apart, revealing NAR true identity. SAN: You are… the Young Lord of this castle! NAR: Kagewaki was a fine lord. He gave the slayers proper burials. Oh yes… I was the one who ordered your care. SAN: Did you kill him? NAR: Kagewaki Hitomi…But now, that is who I am…the lord of this castle. SAN: (leaps towards NAR) Damn you! NAR blocks SAN’s blade attacks with TET. He attacks SAN’s blade, which shatters. NAR cuts her with the sword, sending her to the ground. KIR bites in NAR’s shoulder. NAR, unflinching, lets out a miasma. It is too much for KIR, who falls to the ground and transform back into its tiny form and cringes in pain. NAR: My miasma is stronger than any poison gas. Not even you, Sango, can withstand it. A lock of hair around SAN’s wrist while her blade was, expands and coils around her. It then disappears abruptly, letting out a miasma. SAN, shocked, shields her face. The miasma overpowers her, and her legs give way, making her kneel on the ground. The miasma dissipates. SAN gasps for air. SAN: (regains her breath) Don’t make me laugh. My only goal in life is to destroy you! I will avenge my father and comrades! I will kill you! SAN’s face softens at the sound of Kohaku’s name. KOH walks down the stairs behind SAN, dragging his sickle and chain. Hesitating for a moment, SAN turns around to face him. KOH: (raising his sickle) Goodbye…Sister. INU-gang arrives outside the castle. MIR: Is this it? This is where Naraku is hiding! A scream is heard from the castle. Inside the castle, KOH is slashing at SAN, who is crying in agony. She does not retaliate or even defend herself, however. One attack sends SAN to the ground. KOH retrieves his sickle-chain. SAN: Kohaku…Kohaku! Snap out of it! In the background, HIR throbs with a red glow. It jolts a few times, and yanks itself out of the roof, landing behind SAN. SAN hesitates. She reaches weakly for HIR. NAR: (voice-over) Yes Sango… Kill him. Kill your brother with your own hands! Cut to NAR’s profile, glaring ahead. NAR: And then pray that you want to continue living in this world, that you alone want to be saved! When you kill Kohaku and you are bathed in his blood, the Sacred Jewel will glow brighter with the power of the Dark. Cut to SAN reaching weakly for HIR. NAR: The more sullied it is, the more beautifully the Sacred Jewel glows. SAN is about to touch HIR. KOH raises his sickle in preparation. SAN holds back. SAN: (laughs in irony) Kill you…? How could I kill you? SAN turns around to face KOH and walks towards him slowly. KOH expressionless softens. SAN falls on her knees and collapses. KOH lets down his sickle-chain. SHI: Kirara! Are you all right?! KOH drops his sickle and falls on his knees. He looks at SAN, trembling. MIR: He made her brother do this?! KAG: This is terrible…How could he?! NAR: (voice-over) The brother who killed his father…and comrades. His sister says she cannot kill him. She loves her brother more dearly than her own life. I do not understand how that can be. SAN, lying on KAG’s lap, regains consciousness. KAG: He tried to make Sango hate her brother so that she would kill him. Then the Sacred Jewel in his back would become more evil. The same trick he used to make Kikyo and Inuyasha hate each other, and fight! (enraged) I can’t forgive him! I’ll never forgive this! Fades to close-up of KOH’s sickle. KAG: Kikyo died so that the Sacred Jewel would remain dormant. Fades to close-up of HIR. KAG: In the same way, Sango refused to fight his brother. KAG: (laughs slightly) Naraku’s such a fool! There’s no way Sango would have done it. (softly) Sango is a kind sister who loves her brother. SAN listens in silence. Fumes appear across the ground. SHI: (holding on to KIR) Huh? (the fumes increases) A miasma! The miasma forms a ring around the group. NAR: Foolish mortals! Drown in this sea of miasma! Flashback of SAN’s conversation with KOH. SAN: Father said you’re getting better and better. End of flashback. Back to the present. SAN struggles to get up. KAG: Sango, you mustn’t move yet. INU: Sango, keep still! I gotta lot of things to say to you! So don’t you dare die! SAN puts her gas mask on KOH, and places her hand on his back. KAG: (noticing the Sacred Jewel on KOH’s back, thinking) I know! Naraku has the Sacred Jewel fragment! (she looks around) There! Cut to a pink glow in one of the buildings. KAG draws an arrow in that direction. KAG: Naraku! Prepare to die! KAG fires. The building explodes, revealing NAR. NAR: (thinking) This woman…What is her power? With hardly any effort, she can purge the miasma…the poison vapors… This power belonged to Kikyo…! It can’t be…! KAG: (drawing another arrow) I won’t let you go even if you beg forgiveness! KAG fires and the arrow emits a white glow. It reaches NAR’s chest and burns a hole in his clothes. It hovers, threatening to pierce through. NAR is fighting its power. NAR: (looking at the arrow) That is none other than Kikyo’s sacred arrow! That means the girl is…! MIR: She purged the miasma and located Naraku! NAR grabs the arrow and flings it away. His head disconnects from his body, which immediately explodes and disintegrates into a miasma. The current of the swirling miasma threatens to pull everyone in. INU: (grabbing KAG who nearly got pulled in) Kagome! MIR: (grabbing SHI) Do not let Kirara go! SAN: (struggling to keep in place) Kohaku! KOH is lifted up in the air, a red light surrounding him. SAN reaches in vain for him. He floats away. INU holds down KAG while the buildings disintegrates and gets sucked away. The castle slowly disintegrates. Morning arrives. KAG and SHI wakes up. SAN is on KAG’s lap. KAG: It was a phantom castle. Cut to INU and MIR, who are already awake. INU looks in the direction where MIR was pointing: TET. Cut to close-up of SAN’s mask on the grass. KAG kneels down and picks it up with both hands. KAG: Yes…I don’t see any Sacred Jewel fragment. KAG: I’m sorry. I couldn’t finish him off. MIR: No need to apologize. Without you, we’d all be dead by now. INU: (kneels down behind KAG) Kagome…I’ve never seen you so awesome before. Cut to SHI trying to stop an injured SAN from leaving. SHI: No, Sango! You mustn’t move! SHI: Sango intends to go somewhere. MIR: Where in the world do you intend to go? SAN: I’m sorry. I cannot stay with you any longer. MIR: Sango…we all know that you were being blackmailed by Naraku over your brother. SAN: (shouts) That’s why…! (turns around to face the group) I will betray you again. (turns back) As long as Naraku as Kohaku under his control…! MIR: Sango, you intend to go after Naraku alone? KAG: But that’s… We’ll all save your brother. MIR: He’s not an opponent one person can handle. KAG: (walks to where SAN is and kneels down behind her) Okay? First, we must tend to your wounds. INU: Will you stop yapping? Just stay together! ‘Cause you fight well! MIR: (putting his hand on INU’s shoulder) See? Even Inuyasha, whose sword you stole so easily, agrees. Okay? So no problem. INU: (shrugs off MIR’s hand and shouts) You make me sound like a half-wit. SHI: Sango, do you dislike us? SAN turns around to hug KAG and wails. She cries loudly without inhibition. KAG: (stroking SAN’s hair, thinking) Poor Sango…How hard it must’ve been for her. (softly to SAN) It’ll be all right, Sango. Zooms out to reveal INU-gang surrounding SAN. KAG: We’re with you now. Last revised on 09 Feb 2008.